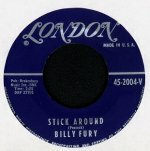 Coming Up In The World/Stick Around was issued as a single in the United States in 1961, but it was not released in the UK. Mike Wilkinson, an American dealer, found the record in a collection he bought, and entered it in an Ebay auction, with a starting price of $2.99. I expected it to sell for up to $50. Until the final day, Sunday August 20, 2000, it seemed on course for that, but after it crept up to about $70, some UK bidders entered very high maximum bids - one of $450 and one of an amount that may have been $500. When this happens, the Ebay computer makes the bids automatically until someone's limit is reached. 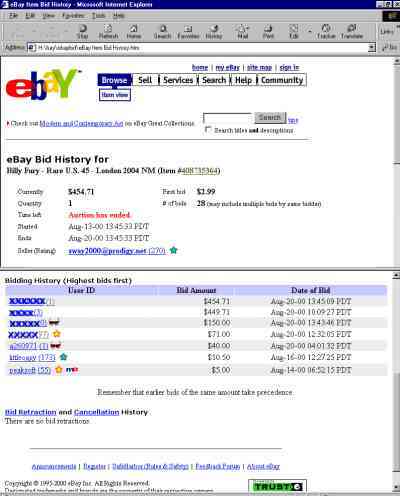 The effect was to send the price sky-rocketing, and the auction closed at $454.71, or about £315. This seemed absurd, and, as it turned out, with good reason, as the high bidder then withdrew. I understand that he or she explained later that they intended to enter a maximum bid of $50, and they believe they accidentally entered $500 instead. Mike Wilkinson tells me that the runner-up is buying the record, at almost the same price. That's a stroke of luck for Mike, but if the accidental bid had not triggered the automatic counter-bids, the record would possibly have sold for a little over $70. So the new buyer has volunteered to pay about £250 more than would have been the case if the accidental bid had not been made. As Mike says: "What a collector or fan will pay for that missing item in their collection is difficult to estimate." The single that caused all of the trouble. The price represents about &pound;1 for each recorded second.